Historically it has been difficult and confusing to find studs. Electronic stud finders would give inconsistent readings and false positives. If you’ve ever sunk your fastener in the wall only to find air, you know what I’m talking about. I can’t count the number of people who have told me they have given up on stud finders and they have reverted to drilling a row of small holes in their wall until they hit a stud. This is so time consuming and inefficient, but so many people do it! In my first home I spent hours and days creating a beautiful Tuscan faux finish on my walls. Touch-ups were really challenging because there was no good way to truly blend the area again. I would have died if someone started drilling a line of holes in my wall. (Or rather they would have died.) Faux finish or not, ruining your wall is not needful! Thankfully, technology has taking great strides and you can now find studs quickly, easily and with precise accuracy. Using the correct stud finder is key to finding studs successfully. 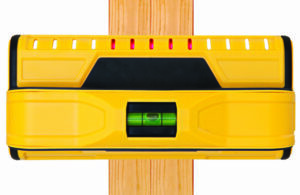 Franklin Sensors has the only patented technology to create instant stud finders. Simply press and hold the button and you can instantly begin detecting studs. Seriously. That’s it. No calibration is required. With the button depressed, the stud finder will illuminate the LED display to show the edge and center of studs simultaneously to accurately identify studs. See the stud’s center and edges simultaneously. Multiple studs are commonly used in construction around headers, windows and doors. The extra-wide LED display on the Franklin Sensors stud finders will accurately identify the width of multiple objects. 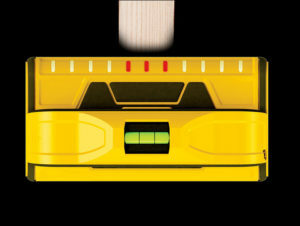 The ProSensor T13 stud finder identifies the stud’s width. 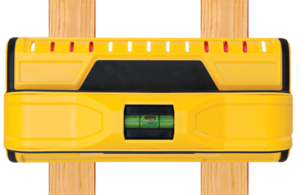 the ProSensor T13 stud finder identifies multiple objects. Some Franklin Sensor models come with additional features such a built-in bubble level, an integrated ruler and a convenient pencil caddy.